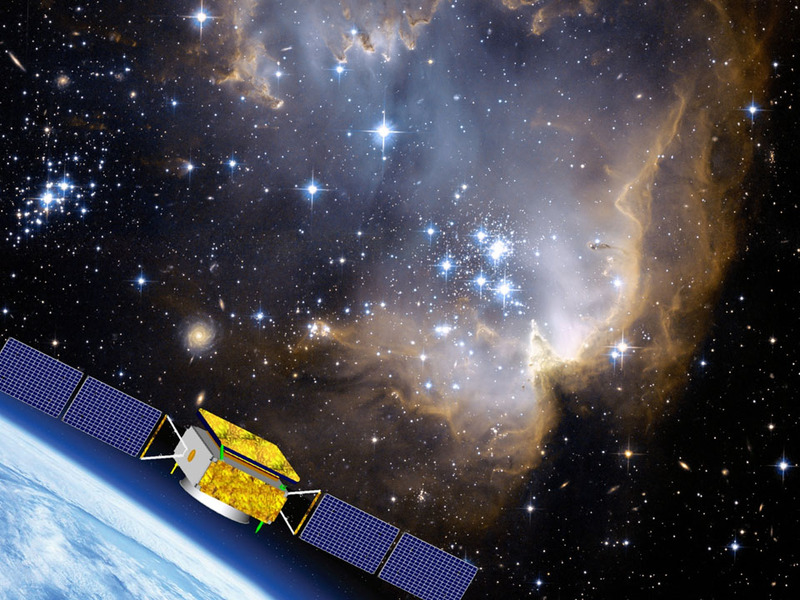 The DArk Matter Particle Explorer (DAMPE) is China’s first ever dedicated space observatory, and it made a splash last month with some interesting insights into the cosmic-ray spectrum of electrons and positrons. But what are cosmic rays, or charged particles coming at the Earth from space, so interesting, anyways? Well, for one, even though they were discovered in the early 1900s, we still have not definitively identified any individual sources of them, and there are still many questions about their acceleration mechanisms. In fact, these questions about cosmic rays drive a very large percentage of the particle astrophysics experiments. Cosmic ray electrons and positrons (CREs) are of particular interest, as they shed light on the nature of sources that produce them. This is because different cosmic ray sources cause different deviations (called “breaks”) from the typical CRE energy spectrum. The potential CRE source that gets the most attention from the general public is dark matter. In WIMP models (one of the most popular dark matter theories), dark matter annihilation would create electrons and positrons. Other viable CRE sources are nearby pulsars and supernova remnants. A few years ago, two different experiments measured an excess of positrons over what would be expected. We still aren’t sure what the source of this excess is (although we may be getting closer to an answer) and precisely measuring the CRE spectrum could help distinguish different CRE sources. This is where DAMPE (Figure 1) comes in. 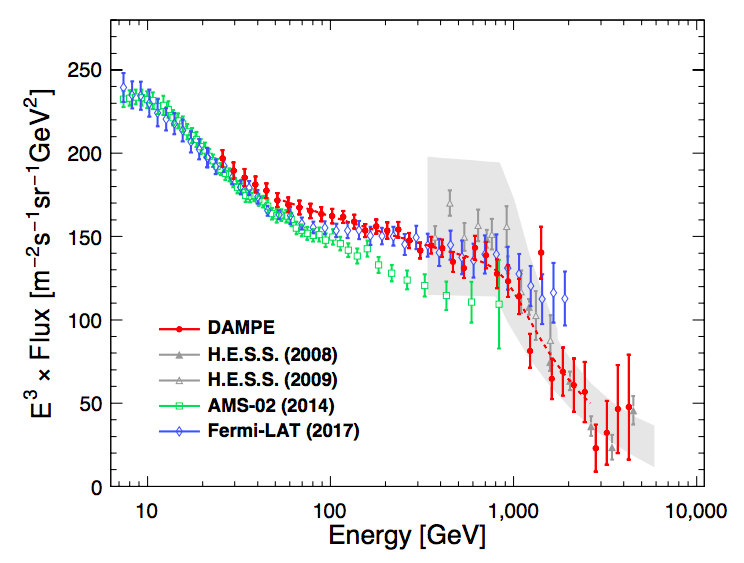 Most cosmic rays are protons, but the equipment on the DAMPE satellite is capable of rejecting > 99.9% of the protons while keeping ~90% of electrons and positrons (the particles of interest). Using 530 days of data taken between December 2015 and June 2017, 1.5 million CREs were collected in the energy range of interest (25 GeV-4.6 TeV). When the fluxes of these CREs are plotted against their energies (Figure 2), the data appears to follow a broken power law with a spectral break at 0.9 TeV (i.e. the data looks like a power law, with less particles being found at higher energies, but the index of the power law changes at 0.9 TeV). Breaks like these are what can tell us about the sources of cosmic rays. This result confirms an indirect measurement made by the telescope HESS a few years ago. HESS is a ground-based telescope and due to the atmosphere, can’t observe CREs directly. Their indirect measurement therefore had relatively large systematic errors. DAMPE is expected to operate for at least a few more years, which will allow for the measurement of an even more precise CRE spectrum, narrowing down which models of nearby pulsars and/or dark matter decay and annihilation are allowed within the confines of the known positron excess. The authors end their paper by noting that when gamma-ray and cosmic microwave background data are also taken into account, even bigger discoveries may occur.